If you're guessing this piece has something to do with Bombay furniture, you'd be correct. I left a teaser in my previous re-blog. In that earlier adventure, Mrs. Dude found a Bombay Company Furniture half table for $30 at a garage sale. She sold it later that same day on Craigslist for $60- doubling her money in just one day! A sweet score by any measure, but we recently outdid that Bombay flip. You may also remember in my first blog of the new year I proclaimed 2012 was going to be a great year! This furniture set was the reason why I made that enthusiastic prediction. On New Year's Day, we visited Mrs. Dude's sister in her suburban neighborhood about an hour from our house. After an afternoon of football, good food and family, it was time to head home. As we left, it was dark outside and beginning to rain lightly. Driving down the street, we were only a few houses from her Sister's home when we spotted something at the neighbor's curb. Although hard to see at first, it turned out to be two pieces of furniture that looked vaguely familiar. Pulling closer still, we realized what was sitting out at the curb-a Bombay Company Furniture cocktail table and matching pedestal! It was the exact style as the half table Mrs. Dude had doubled her money on a few years before. In the excitement of spotting this find, Mrs. Dude began excitedly hitting me in the arm while giving orders. Peering out the car window, she commanded like a drill Sargent, "Slow down...okay....Stop, Stop, Stop !" She was making me nervous with all these intimidating orders. It was like we were suddenly on some kind of black-ops commando mission! Despite my bruised arm, I found the strength to pull over and maneuver the van so the headlights would shine directly on the furniture. 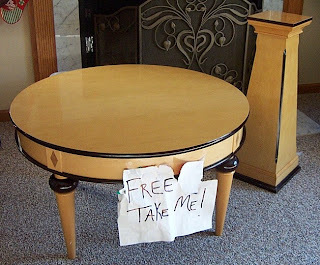 Taped on the table was a paper sign with hand written message, "Free-take me!" (That's the actual sign in the pix) We sat in stunned silence for just a second, then Mrs Dude began to whack me in the arm again! (It was starting to hurt now.) Her voice went up a few more octaves and she yelled excitedly, "Quick, go out and get it! Go-Go-Go!" I dutifully jumped out of the van. For the record, Mrs. Dude didn't have to keep hitting me in the arm...I was going out in the rain anyway! Like a trash-picking Ninja, I quietly grabbed the two furniture pieces and carefully placed them in the back of the van. Slamming down the hatch, I jumped back behind the wheel and hit the gas. The old mini-van peeled down the rain slicked street, speeding away at a solid 20 miles per hour! Feeling like we just pulled off the biggest heist in the world, we both started giggling like Bonnie and Clyde after robbing a bank. We exchanged a few, "Can you believe it?" and "Who would leave that stuff out at the curb?" comments, while looking back at our cargo in disbelief. After getting a few miles behind us, I found a well-lit parking lot. We stopped to wipe down the furniture and inspect it. The night and rainy mist hadn't played tricks on our eyes. It was definitely Bombay Company Furniture and it was in excellent condition! More high fives and giggles ensued as we headed home. Remembering how well Mrs. Dude did on her last Bombay flip, I posted our trash-picked treasure on Craigslist the very next day. I was little heady from our New Year's day find and started with an asking price of $250. A bit high, but I figured you just never know. While I was initially pretty psyched about the set, nobody else seemed to be. I received absolutely no inquiries. This was in stark contrast to Mrs. Dude's half table, which sold in just one day. Hoping for some bragging rights, I began to lower the price incrementally. The price of the set continued to drop with the help of Mrs. Dude's weekly inquiries. She felt I set the price of the set too high. Feeling all emboldened from her quick sale of the previous table, she would innocently zing me asking, "Has anyone inquired about the Bombay set yet?" I would sheepishly respond, "No dear, but I'll lower the price if you want, OK?" Further pouring salt in the wound, Mrs. Dude would feign bewilderment and wonder aloud, "Gee, I sold my half table in just one day. I wonder what the problem is?" I would respond with a shrug while thinking to myself, "Ok, I get it...lower the price!" After weeks of this slow drip-drip-drip of subtle, but ruthless attacks on my pricing strategy and my ego, I finally dropped the furniture to $125. So it turned out to be a great beginning for 2012. After a few pointy elbows in my arm and few shots to my ego, we made $125 on our New Year's Day trash pick. After all my bruises heal, I may just drive by that neighbor's house again! People are seriously crazy... "free take me"?! LOL Nice flip, you'll be scouting that house every visit from now on! J-I know right? That's why we were freaking at the site of these two beautiful pieces sitting out at the curb! My guess is it had something to do with the post-holidays and they were making room for new furniture. For sure going to look closely at that house, next time we visit! Gorgeous table for free! Unbelievable! By any chance is Mrs Dude Italian? I do a backhanded whack that Mr Clamco calls the Sicilian whip. lol. Miss Clamco - Sicilian whip-Ha! Not Italian, although with the constant whacks, maybe she has some distant blood-line we don't know about! Only to be a fly in the car when you guys go on your episodes! What a riot! Great fun and find! Ha! I think we need a camera in the car, that's a show right there!